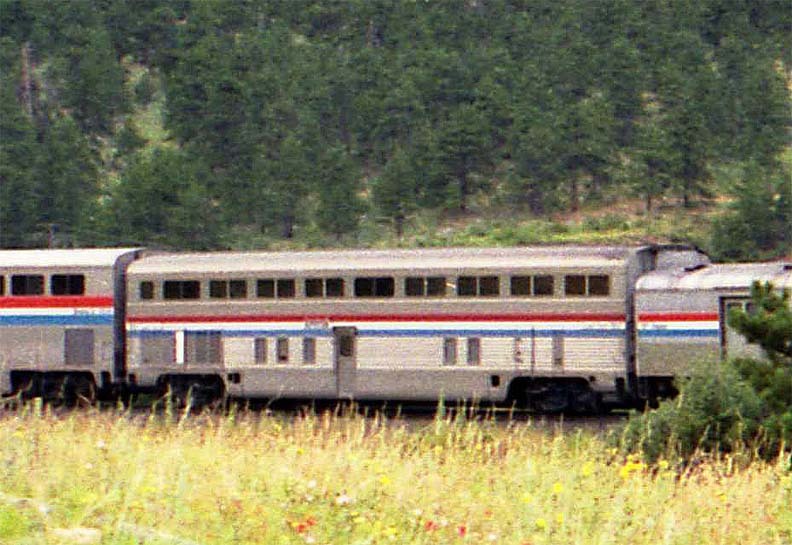 The dorm coaches were used at the front of trains during Amtrak’s S1 era, but were gradually phased out as the S2 Transition Sleepers entered service in the 1990s, and all are off the roster now. As of this writing, five Pacific Parlour Lounges remain in Amtrak service on the west coast. 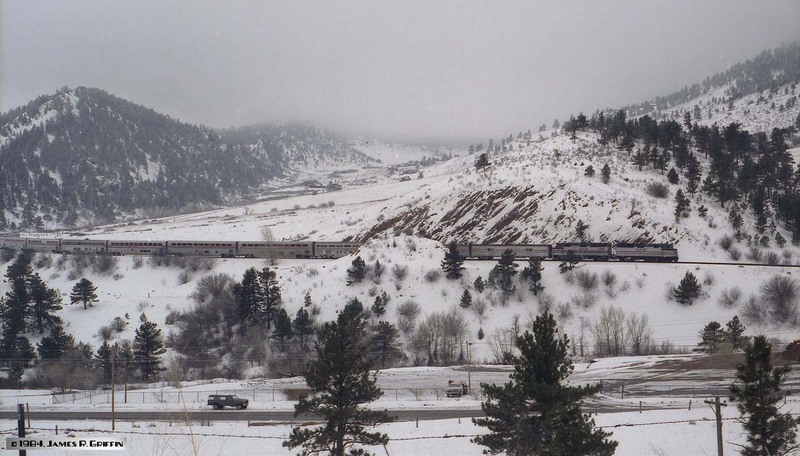 I also videotaped one in Colorado on 12/29/1994 on train No. 5. 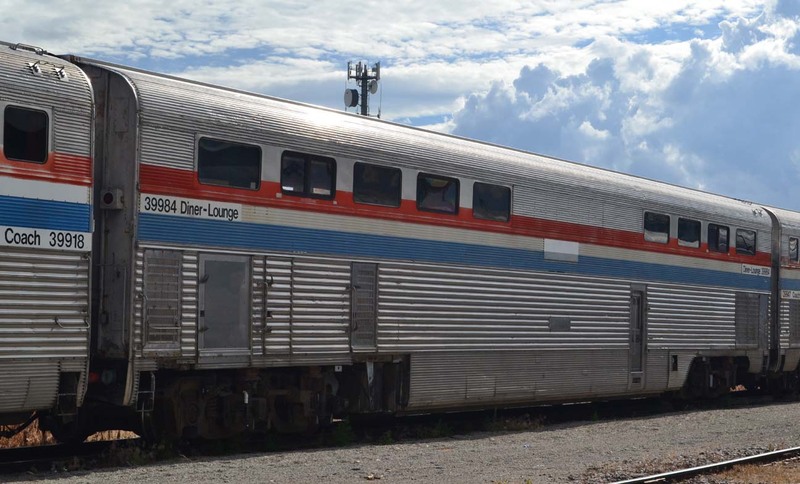 Several of these former El Capitan cars appeared in Alamosa for service and rebuilding in 2015 by the SL&RG, all wearing Phase 3 stripes. I took advantage of this rare opportunity to get some portraits. *The El Capitan was coach-only, hence no sleepers. “Pacific Parlour” car No. 39972 in Seattle, 7/24/2009, two views. Taken from a tour bus, the image quality could be better, but you can still see the distinguishing features. 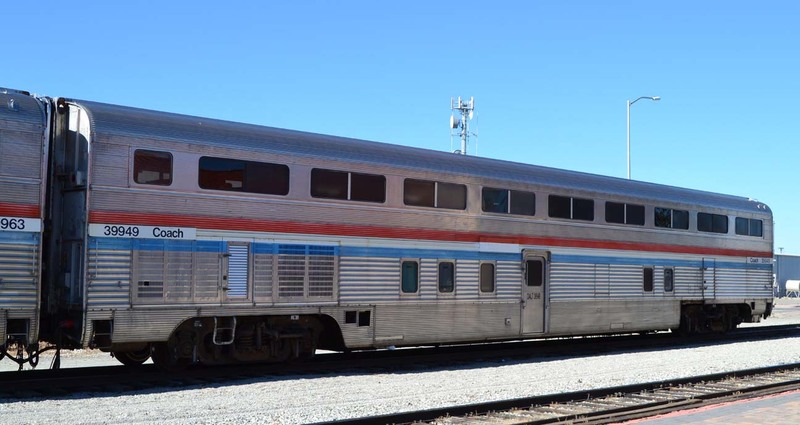 TOP: Note the overhead windows which inspired the Superliner Lounge Cafe / Sightseer Lounge design, but see how they are shifted towards one end of the car. Also note the slight height difference when compared to the adjacent Superliners. BOTTOM: closer view of the window end of the same car. 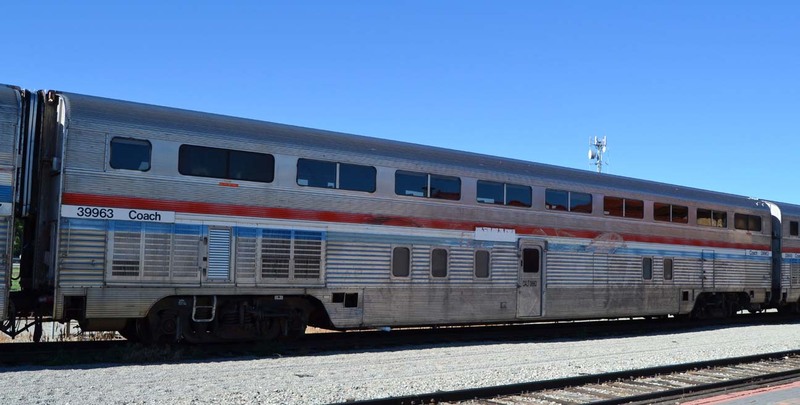 See the wider Amtrak California blue stripe. Dorm Coach on train No. 6 in July 1986– it is just behind the baggage car. From this angle you can easily see the difference in height between the El Cap cars and the newer Superliners. Note the straight stripes, and contrast to car 39918 shown below. Coach 39947. All these cars are in Phase III stripes, so they apparently saw service on Amtrak into the 1980s. Some were certainly used on the Reno Fun Train. Bottom: rear end, showing the high-level diaphragm. Diner – Lounge No. 39984. Note the 3-axle trucks– the only high-level cars of any model to require them. The diners weighed in at about 97 tons. Transition dorm coach on train No. 5, March 1984 at Coal Creek Canyon. Though far too distant to get a number, it’s easy to distinguish it from the Superliners behind it.